LATEST NEWS – ACTION GETS RESULTS! Strike action against job cuts in the Home Office has been suspended after 1100 new jobs announced. There are signs of movement in a number of these campaigns so lets try and and get some victories! Please get to a picket line if you can or send messages of support. Messages of support to PCS Branch Secretary graham.eve@ng-london.org.uk. PCS members will strike on Friday for the first of four 2-hour walk outs in protest against staff cuts. The decision to force the close of Remploy means that thousands of disabled people and their families will be put into poverty and their health is bound to suffer says GMB. Strike action set for tomorrow, Thursday 26th, by cleaners at John Lewis Oxford Street has been cancelled following further negotiations and consideration of a new offer by the employers. Last Wednesday 1,000 firefighters marched through Chelmsford as part of Essex FBU’s 24 hour strike against cuts. With some signs of progress in the dispute the strikes will run from 4-8pm. You can also follow us on Twitter and join our Facebook group. 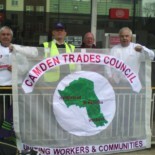 This entry was posted on July 26, 2012 by CAMDEN TRADES COUNCIL.